Sri Kumaraswamy temple is located atop a hillock known as Mount Joy, a name given by late Sri Narahari Rayaru, with walkways and stairs leading to the summit. It is believed that a Lingam was consecrated during the period of Kempegowda. Sri Narahari Rayaru is said to have got a tower built there. Hence, the hillock is also popular as Naraharirayara gudda. Sri Krishnaraja Wodeyar IV is believed to have developed the temple further. The temple at the top of the hill is dedicated to Lord Kumara Swamy. Special prayers are performed during "Subbaraya (Subrahmanya) Shashti". By the side of Lord Kumara Swamy, idols of holy Shiva Linga and Lord Ganesha in a sitting posture and Goddess Parvathi have been consecrated. Besides, idols of Navagraha have been consecrated in a separate shrine adjoining the main shrine. 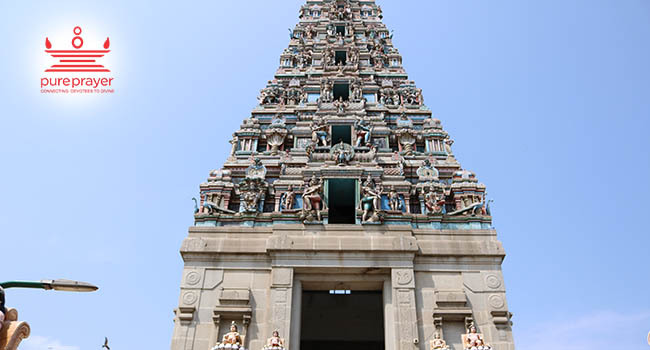 The Gopuram at the entrance of the temple is reminiscent of the Gopuram at Swamimalai temple in Thanjavur, Tamil Nadu. ಶ್ರೀ ಕುಮಾರಸ್ವಾಮಿ ದೇವಾಲಯವು ’ಆನಂದಶೈಲ’ ಅಥವಾ ’ಮೌಂಟ್ ಜಾಯ್’ ಎಂದು ಕರೆಯಲ್ಪಡುತ್ತಿದ್ದ ಸಣ್ಣ ಗುಡ್ದದ ಮೇಲಿದೆ. ನರಹರಿರಾಯರ ಗುಡ್ಡವೆಂಬ ಹೆಸರೂ ಈ ಪ್ರದೇಶಕ್ಕೆ ಇತ್ತು. ಕೆಂಪೇಗೌಡರ ಕಾಲದಲ್ಲಿ ಪ್ರತಿಷ್ಠಾಪಿಸಿದ ಒಂದು ಶಿವಲಿಂಗವು ಇಲ್ಲಿತ್ತು ಎಂದು ಹೇಳಲಾಗುತ್ತದೆ. ನಂತರ ನರಹರಿರಾಯರು ಗೋಪುರ ಹಾಗೂ ಮಂಟಪವನ್ನು ನಿರ್ಮಿಸಿದರೆಂದು ತಿಳಿದುಬರುತ್ತದೆ. ನಾಲ್ವಡಿ ಕೃಷ್ಣರಾಜ ಒಡೆಯರ್‌ ಅವರು ಇನಾಂ ಜಮೀನಿನ ವ್ಯವಸ್ಥೆ ಮಾಡಿ ದೇವಾಲಯವನ್ನು ಅಭಿವೃದ್ಧಿ ಮಾಡಿದರು.